ISLAMABAD: Lawmakers in the National Assembly spoke their minds and appreciated the performance of speaker National Assembly for conducting the business of the House in a smooth way throughout the five years tenure. Dr Arif Alvi regretted that the JUI-F chief Maulana Fazl-ur-Rehman had objected the merger of FATA Khyber Pakhtunkhwan. He also raised the water shortage issue in Karachi saying his party had time and again stated to resolve it. He was of the view that in the coming days, the power loads shedding would increase and stressed the need for conservation of water. He said that more trees should be planted to make environment clean. “I have started distributing tress among the people in Karachi and such a move should also be started in other cities,” he added. Ramesh Lal said a prominent Sikh religious leader Charanjit Singh Saga was killed by the unknown persons in Khyber Pakhtunkhwa. He asked the speaker to issue an order to Khyber Pakhtunkhwa government for taking action against the killer. Asya Naz said that the parliament will complete its constitutional tenure and the present parliament had passed legislation related to women. She also appreciated the performance of the speaker National Assembly Sardar Ayaz Sadiq for conducting the business of the parliament in smooth way. She also thanked the ministries employees and employees of assembly for extending cooperation. Sheikh Salahuddin thanked the speaker for highlighting the masses issues. Sahibzada Tariq Ullah said that government should not increase the prices of petroleum products and said it will increase the inflation. He also raised the issue of load shedding in his area. Muhammad Jamal Ud Din said that he is happy that the parliament is going to complete its constitutional tenure. He said it was unfortunate that elected prime minister had not been allowed to complete his constitutional tenure. He appreciated the performance of the government. Abdul Sattar Bachani expressed the hope that PPP and MQM will win the upcoming election. He asked MQM to raise the issue of census in the next government. Chaudhry Khadim Hussain appreciated the performance of speaker National Assembly for brining consensus for nominating the caretaker prime minister. He also announced not contesting the up coming elections due to age factor. Ali Muhammad Khan while appreciating the performance of the speaker and said that proceeding of the House was conducting in a smooth way. He paid tributes to security forces for summoning a former head of intelligence agency to GHQ. Major (Retd) Tahir Iqbal lauded the services of Speaker for running the house smoothly. He urged politicians to resolve their issues bilaterally. Parliament’s Standing committees should be empowered to serve the country in a better way. 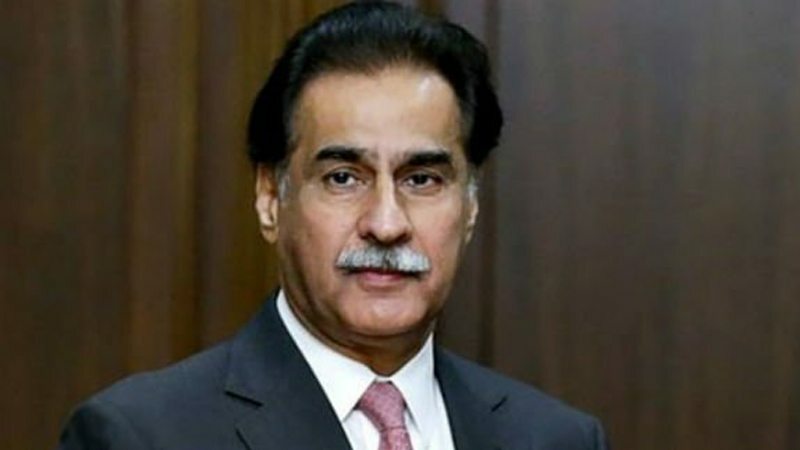 Speaker Sardar Ayaz Sadiq conferred portraits to three parliamentary whips including Shireen Mazari, Ejaz Kalhrani and Sheikh Aftab as a tribute for playing positive role in Parliament in last five years. Saman Sultana Jaffery thanked Speaker for providing chance to speak in the House to a back bencher like her. Sajida Begum, lauded the services of Speaker for smooth running of National Assembly. Captain Safdar lauded the services of political parties for passing Fata Reforms Act. Ejaz Hussain Jakhrani, “I congratulated the speaker National Assembly Sardar Ayaz Sadiq for conducting the business of the House. The love I had received from Sardar Ayaz Sadiq is unaffordable. He also appreciated the cooperation of staff of Assembly. He said that continuity of the democratic process should continue. He said the parliament is the supreme body. Mian Abdul Mannan thanked the speaker and deputy speaker for running the business of the house in smooth way. Sher Akbar Khan while appreciating the performance of the speaker and asked the caretaker to take action to facilitate oversees Pakistanis. Dr Azhar Jadoon appreciated the performance of the Speaker National Assembly Sardar Ayaz Sadiq and said all the members of the parliament for the speaker. He said that asked the deputy speaker to issue instructions to the National Highway Authority for the construction of Abbottabad-Mansehra road. Syed Waseem Hussain, said that he always raised the voice for his constituency and asked the federal and provincial governments for establishing of university, schools and colleges. Ayaz Sadiq for extending cooperation. Muhammad Muzammil Qureshi said that it was unfortunate that the government had not given any development funds during the last five years. Lal Chand Malhi thanked all the members of the parliament for extending cooperation to minorities. He said he always helped by the parliamentarians for raising the issue of minorities. Kishwar Zehra lauded speaker and deputy speaker for services rendered in last five years.She stressed passing special laws for facilitating special persons. Rana Zahid Hussain said PML-N government has fulfilled most of the promises made in the election manifesto. Khyber Pakhtunkhwa government has failed to produce even a single unit of power during their tenure of five years. He thanked Assembly staff for serving and guiding the members. Salman Baloch said the government had not given development funds to MQM legislatures. 65 persons were killed in Karachi in the last heatwave due to non availability of electricity in the city. 20 provinces should be created in the country on administrative basis. Bhawan Das said the authorities have not yet taken notice of the target killing of Sardar Charanjeet Singh in Peshawar the last day. Mehboob Alam said the issues of Karachi have not been resolved yet by the rulers despite best efforts of MQM legislators.The ongoing accountability process should continue in the country despite holding of elections in July. Dr Nighat Shakil said Parliament should be accorded respect. She thanked assembly staff, speaker, deputy speaker for rendering unmatched services to parliamentarians.